SAGE India Digest: Social Media- The latest buzzword in the world of marketing! Social media is a dynamic part of the Internet world that has evolved significantly in the past couple of decades. Internet has given marketers new ways to promote their products and services and new ways of communicating with the consumers. Following such technological changes, WOM is getting renewed interest in academic arena and becoming a buzzword in the world of business. A significant proportion of consumers refer to reviews of products and services posted on social media before making their purchase decisions. An article in the Management and Labour Studies presents findings on consumer decision-making variables and uses those to explain how social media WOM works and how Social Media can have a dramatic impact on any brand’s reputation. In recent times, social media WOM in the form of opinions of friends posted on social networking sites or even the opinions of strangers posted on online forums play an important role during consumer information collection, processing and evaluation stages. And as the consumers are spending more and more time on Internet and social media, companies should also direct their marketing efforts to these new mediums. Perceived risk, brand attitude and purchase intention are three of the most important constructs in the domain of consumer decision making and source credibility, product knowledge and involvement level are also the important correlates of WOM and consumer decision making. The article studies all of these and their inter-relationship from the perspective of the recipient consumer and explores how it will impact their decision making process. 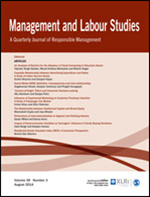 Click here to read Social Media WOM: Definition, Consequences and Inter-relationships from Management and Labour Studies! As the world's fastest growing economy and one of the world's most ancient civilizations, there has got to be something positive to report on. Social media marketing is a great way for businesses to market themselves. But I feel that It isn't easy. In this post, you discuss how your social media strategy can go wrong and what you can do to fix it. Thanks to share with us. In the past couple of years, the internet marketing has become absolute favorite mode of the businesses because the results with this technique are super effective in growing their sales and brand’s credibility. Even for my own business I am utilizing search engine optimization and facebook ads Los Angeles services. Quite happy with the results.